As weird as it may sound...I love these pictures...and I love cats. So...I don't know if anything is wrong here and I'm pretty sure the cats aren't in any kind of pain! So...I like them! 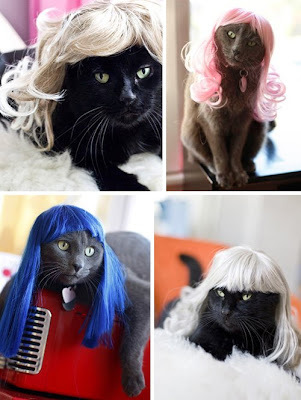 As it turns out, these are Halloween wigs specially made for cats! Plus, the packaging isn't half bad! I want a case like that! You can get them here, or you can visit the site to get more information on them. Enjoy!